Seeing Your Marriage as a Work of ArtThrough more than four decades of marriage, Barbara and Dennis have seen it all--triumphs, tragedies, mistakes, and enduring love and joy. As Barbara's daughters began their own married lives, she wanted to share with them lessons she'd learned through her own marriage as well as those gleaned from years of ministry to couples. In these thoughtful letters she answers tough questions compiled from a multitude of young wives, addressing the realities of marriage with honesty and warmth. Marriage is a complex work of art, and the callings of husband and wife are important individually but must work in harmony to create a beautiful whole greater than the sum of its parts. Throughout this lovely, gift-worthy book, Barbara uses the arts--painting, dancing, gardening, etc.--to reveal this truth in a wise, insightful, and visually captivating way. First, I want to say this book is just beautiful from the inside out. It is a real treasure. As a woman, daughter and wife, this is a book that every female should own. I cannot express how much I have laughed and cried throughout this book. The letters Barbara writes in here makes me feel like a human who struggles, who isn't perfect, who has to make things work in life, in my marriage, and as a woman. The pictures are stunning and not just visually, but the art of how she weaves metaphors to talk about lessons she wants to teach the reader. Full of wisdom, advice, and Biblical truth, I can't but help love this book. It has a beautiful white book marker on the inside of it to hold your spot. I have been utilizing it as a devotional to savor the journey. 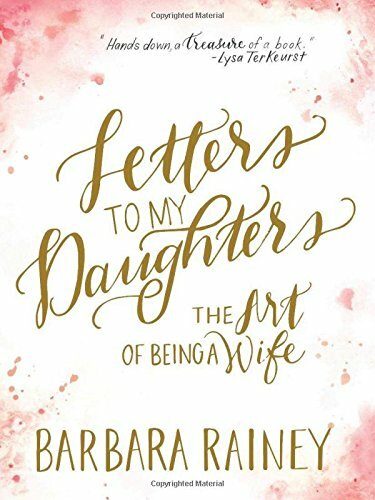 Letters to my Daughter is the perfect gift for someone who has been married for thirty years, someone who is recently engaged or a newly married woman. It is an absolute treasure that I love. I would give this book 100 stars because I just enjoy the wisdom, the beauty and the Godly insight of this book. Thank you Bethany House for providing me a complimentary copy for my honest review. I was not compensated for a positive review. two daughters-in-law), and "Mimi" to twenty-one grandchildren. After graduating from the University of Arkansas with a Bachelor of Arts degree in history, Barbara joined the staff of Campus Crusade for Christ in 1971. Her husband, Dennis, whom she married in 1972, is the president of FamilyLife, a ministry of Campus Crusade that is headquartered in Little Rock, Arkansas. Sarah, this book sounds like one I should read. I loved your thoughts.